Accurate knowledge of different signals from the brain and other body parts are very important in understanding neural substrates of many physiological and pathological functions of the brain and the body parts. This quest for knowledge on the human neural makeup and biosignals has created the needs for better signal processing techniques. With new processing methods, researchers are uncovering new information content that can potentially transform the ways various diseases were previously diagnosed and subsequently treated. Over the years, different signals from the human body have been studied and characterized. These signals include electroencephalogram (EEG), electroencephalogram (EEG), electrooculography (EOG), electrocardiography (ECG), and electromyography (EMG), among others. Under different experimental conditions and measurement techniques, many of the parameters obtained have not been consistent, which continues to pose major challenges to electronics designers developing neural systems to manipulate and process these signals. However, while these measurements results have varied primarily due to the environmental conditions (e.g. characteristics and positioning of electrodes, nature and characteristics of equipment, anatomical minor differences, presence of glands and blood vessels, different tissue fat levels, etc) under which they are obtained, there are commonalities among them. This makes it possible to set boundaries upon which system designers could target. In this article, we present the values of measurement results of various biosignals signals reported by many published papers. Our focus here is primarily on the electrical properties of the signals that are useful to circuit designers. Accordingly, we do not cover the clinical and physiological components of these signals. 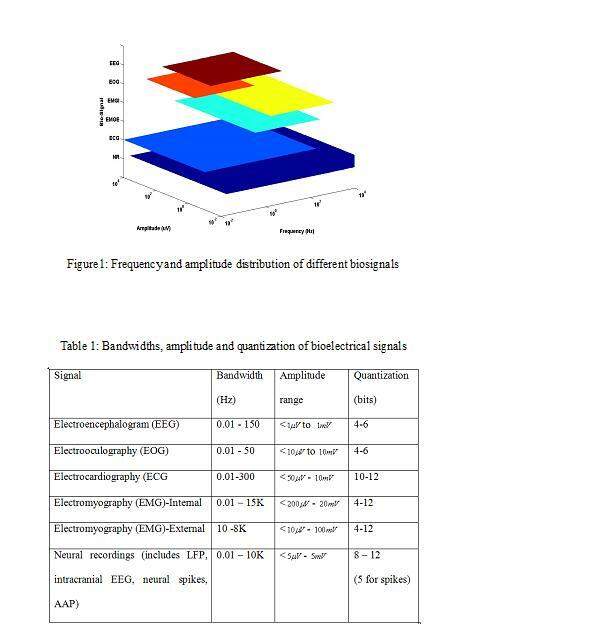 Furthermore, where reported, we present the power consumption, quantization resolution and the noise figures for the published biosignal acquisition systems. It is important to clarify that some of the reported data are from discrete systems while some are from monolithic integrated systems. Based on different published papers, this section presents the properties of some of the most important bioelectrical signals. These signals include electroencephalogram (EEG), electrooculography (EOG), electrocardiography (ECG), electromyography (EMG), and neural recordings. See Figure 1 for the amplitude and frequency plots of these signals. EEG is the measurement of electrical activity produced by the brain as recorded from electrodes placed on the surface of the scalp. When these EEG signals are analyzed, they are used in clinical setting as a diagnostic tool to detect pathologies associated with aberrant electrical behavior or stimulus-directed behavior. A method similar to the EEG is intracranial EEG (icEEG), also described as subdural EEG (sdEEG) and electrocorticography (ECoG). This signal refers to the recording of activity from the surface of the brain (rather than the scalp), i.e., the electrodes, typically an array of spikes, are inserted into the brain tissues. While many literatures lump EEG and icEEG together, we break them apart since the techniques and the environments upon which the data are obtained make the signals to be different. Our Neural Recordings include this icEEG, neural spikes and local field potentials (LFPs). Electrooculography is a technique for measuring the resting potential of the retina with the resulting signal called the electrooculogram. This involves a record of the difference in electrical charge between the front and back of the eye that is correlated with eyeball movement and obtained by electrodes placed on the skin near the eye. It has many applications in ophthalmological diagnosis, recording eye movements and general human-computer interface. ECG is a graphic produced by an electrocardiograph, which records the electrical activity of the heart over time. When electrical waves which cause the heart muscle to pump pass through the body, they can be measured at electrodes attached to the skin thereby providing the activities of the heart muscle. Using an ECG, the voltage between pairs of these attached electrodes, and the muscle activity that they measure, from different directions are displayed. This is a method for evaluating and recording physiologic properties of resting and contracting muscles. It is used to detect the electrical potential generated by these muscle cells when they contract as well as when they are at rest. This procedure is done with the aid of equipment named electromyograph, to produce a result called an electromyogram. An electromyograph detects the electrical potential generated by muscle cells when these cells contract, and also when the cells are at rest. Recorded measured external EMG potentials range from about 100?V to 100 mV, depending on the muscle under observation. Typically, measured frequency range from 14Hz to 8 kHz, again based on the muscular activity under consideration. For internal EMG, the signal amplitude ranges from 1?V to 5 mV while the frequency range is about from DC to 15 KHz. Comparisons of the different signals in the amplitude and frequency domains are provided in the figure above. Table 1 provides the boundaries of the signals in frequency and amplitude based on published data with reported resolution range of converters used for quantization. Notice that measurement noise is taken as the lowest values of the signals.